It’s spring once again here in The Woodlands. All of those outdoor activities you’ve been putting off till the days get longer are now waiting for your follow through! Not to mention, we are now in the window of perfect temperatures before the summertime heat hits. As you get back outside, here are some tips for making the most of the season. Before jumping back in full force, it’s a good idea to take a realistic inventory of where you’re at physically. Don’t try to just pick up where you left off. Start with some light exercise that reminds your body how good it feels to be moving in the sunshine again! In the first few trips outdoors, focus on getting your heart rate up and soaking in some Vitamin D. Also, take mental notes of how your body is feeling… Is there any pain in your movement while you exercise or is the soreness out of proportion for the amount of exercise you put in? A simple “maintenance” appointment will not only give you a baseline snapshot for how your body is doing, it’s also an opportunity to knock out any issues that may have crept in through the inactive winter months. Be sure to bring up any of those mental notes mentioned above. While you’re at it, you might as well take advantage of some full body Cryotherapy. Cryotherapy has tons of great benefits to your body, including boosting your immune system and increased energy. Whether you get a coach to go for peak performance or buddy up with a friend, there’s strength in numbers! There’s nothing like a little accountability and friendly competition to keep you on track on the days you’re tempted to stay in. Schedule regular workout dates with a friend to help you stay committed. Don’t sabotage your workout by not paying proper attention to what you’re putting into your body! Keep water close to you, and sip on it throughout the day to stay hydrated. Make it a goal to drink ten glasses of water a day. When it comes to meals, eat real, whole food! Eat nutritious meals with as few ingredients as possible – fresh veggies and fruits, whole grains, and clean proteins. You’ll be amazed at how much of an impact this will have on your workout. As the intensity of your training increases, it’s important to remember the vital role recovery plays in getting stronger. Coming in for some NormaTec compression can really speed up your recovery time, relieve muscle swelling and soreness, and help you perform at your peak. A lot of our patients also take a Wellness Maintenance approach to keep their body at peak performance. Once you’re back out and on the fitness track again, the key is to just keep going. The main thing is to find an activity/exercise/program that you really enjoy and stick with it. 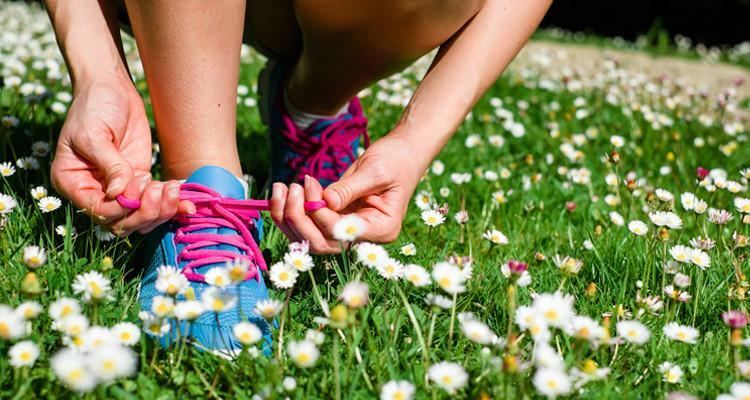 Let the spring temps and sunshine carry you through the time it takes for these activities to become sustainable health habits continue throughout the rest of the year. As you settle into this active lifestyle, not only will you look better, but you’ll feel better and have more energy.